Amaze your students with a colorful, fun experiment. Materials and chemicals are provided to make cyanotyped material on cloth or paper. 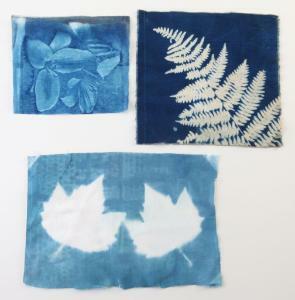 The material to be cyanotyped is prepared by the students in advance and allowed to dry. After a few hours, students can place objects on the material and then expose it to sunlight or UV light. Once the UV light hits the cloth or paper, a light-activated redox reaction occurs. Areas that are exposed to the light turn blue, while areas not exposed stay unchanged. Then, simply rinse the material under water and a white imprint of the object is created on a dark blue background. Developed in conjunction with Linda Stemer, this kit can be adapted for use from 1st graders through 12th graders. Includes materials for a class of 30 students. Note: White cotton T-shirts are not provided in the kit, however, you can conduct the experiment using your own in place of the provided cotton cloth.